Walk through the doors of the Fundy Geological Museum and enter an ancient world. 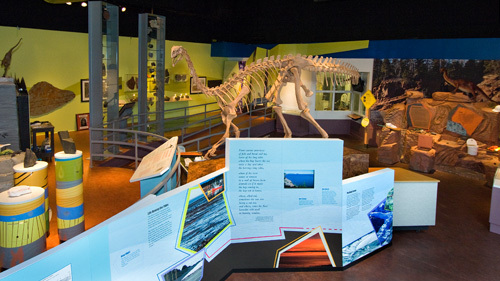 Our amazing exhibits offer you the chance to see some of the oldest dinosaur bones in Canada. Learn about the world-famous dinosaur discovery that was made in Parrsboro in 1984 (announced in 1986)—the largest of its kind ever made in North America! Get a close-up look at the creatures who reigned supreme in this region millions of years before we arrived! Check out the world’s first reptiles, the planet’s earliest dinosaurs, giant dragonflies and bug-like creatures as big as baseball bats! Fossil fanatics and gem lovers will fancy our exhibits! At Fundy Geological Museum, you can explore Nova Scotia’s mineral treasures and age-old fossils, discovered in nearby sea cliffs right along the Fundy Shore. Walk where the dinosaurs walked! Discover the area’s rich geological past on a guided tour with our museum experts! Interested in programs booking a program at the Fundy Geological Museum?